Felix Hernandez was as dominant as ever tonight. Going up against the demonstrative Boston Red Sox, with King's Court in his corner, Felix needed to shine. Especially considering how the offense has performed at home as of late, there was little room for error. Felix made every effort to win the game on his own and took all nine innings to do it. 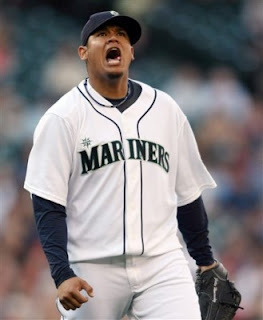 After striking out 13 batters and walking only one, Felix was relying on his offense one last time in the ninth inning. With his pitch count already at 128, he probably wouldn't have made it back to the mound in the 10th. In the bottom of the 9th, with one out, Casper Wells hit the first extra base hit of the game. A double to center field on a line and the Mariners were in business. Pitcher, Scott Atchison, intentionally walked Justin Smoak to get the double play in order and stood to face John Jaso. Jaso took the first pitch he saw and slapped it into right field for a single as Casper Wells went flying around third trying to win the game. The ball was believed to be caught by catcher Jarrod Saltalamacchia as he reached to tag Casper. Wells tried sliding around the tag but was still hit by Saltalamacchia's glove. Just as Wells passed, the ball was seen rolling away from the catcher and Wells leaped and made sure he tagged the plate as he was called safe by home plate umpire Adrian Johnson. There is always a party when there is a walk off hit, especially when there had been little, to nothing done offensively all game by either team. Jaso's hit was only the 5th hit of the game from the M's as they tied Boston's 5 hits against Felix Hernandez. Jaso and Wells both were mauled out on the field as players surrounded them to celebrate. It's a great sight to see, considering there hasn't been a lot to celebrate as of late. Felix now has a winning record on the year at 6 and 5. That is a very good sight to see. What wasn't a great sight to see was Franklin Gutierrez getting hit in the face by pitcher Franklin Morales on a pick off attempt in the bottom of the 4th inning. Guti lunged back toward the bag and the throw was on the inside part of the bag and really high. The ball hit Gutierrez in the ear and he went down to the ground. Trainer Rick Griffin and Eric Wedge were out of the dugout in a hurry and we all sat and watched as Guti remained with his face to the ground in immense pain. Guti was able to walk off the field and it was stated after the game that he had a mild concussion and that he would be evaluated tomorrow. It's a tough sight to see when Guti has missed so much due to injury already. We hope that he is alright. Still not a lot of offense here at Safeco, but we'll take a win any way we can get one. Against the Red Sox, we'll take a victory for King Felix any day of the week. We just need to pray that this will establish some serious momentum for this team and that we can start to produce runs on the board. We've only got 5 runs in the past 4 games and I don't believe that Boston will be held scoreless all series.